Given the many personal things going on in my life (health issues, new job, etc.) and the fact that I really want to use my spare time to work on my own photography, I've decided to put the podcast on haitus for the foreseeable future. What this means is that the complete archive of episodes will remain in place and continue to be available to listeners through this web site as well as through iTunes (as always, totally free of charge). This is not say I won't ever restart the podcast at some point but, as most of you know, it is important to prioritize those things in life that give you the most pleasure and for me it is my own photography which needs to come first. The International Guild of Visual Peacemakers (IGVP) is an organization devoted to the breaking down of stereotypes by displaying the beauty of cultures around the world. The IGVP seeks, through it’s members, to build bridges of peace across ethnic, cultural, and religious lines through visual communication that is both accountable to an ethical standard and created by those who authentically care about people. For this podcast, I interview Mario Mattei, president and co-founder of IGVP. Pete Brook is a freelance writer who focuses on the politics of media, visual culture and issues of social justice as they relate to photography and photojournalism. Since 2008, he has published writing about photography produced within and about prison on his own website Prison Photography. This year, Prison Photography was awarded a LIFE.com Photoblog Award and Prison Photography was also recommended among the Top Ten Best Photoblogs by the British Journal of Photography. For two years, Pete was a volunteer art teacher and working board member with University Beyond Bars based here in Seattle. But he'll soon be leaving to embark upon a 12-week research trip interviewing photographers who've documented the rise of America's prison industrial complex.You can support his Kickstarter project until September 29th, 2011. Pete is also lead blogger for Raw File, Wired.com’s photography blog. Pete is interested in how images are manufactured, distributed and consumed. Dave Anderson is an image-maker whose work as both a photographer and filmmaker have been celebrated in the United States and abroad. Dave's project Rough Beauty was the winner of the 2005 National Project Competition from the Santa Fe Center for Photography and became the focus of his first book, which was published in three languages with an essay by Anne Wilkes Tucker. His latest monograph, One Block: A New Orleans Neighborhood Rebuilds, was published in 2010 by Aperture Books and featured in the New York Times and Time Magazine as well as on Good Morning America and CNN. Wouter Brandsma has been involved with photography since his childhood. He uses photography as a form of personal expression. In January of 2011 Wouter began a photo-a-day project and posted his results to his blog. I began following Wouter's journey at the outset and have been intrigued at how his photographs truly represents a personal exploration rather than merely snapshots of his surroundings. Now, six months into the project, I felt it was time to talk with Wouter about this engaging technique for living a photographic life. Matt Black is a documentary photographer who has focused much of the past fifteen years on photographing forgotten people and places. He has a deep interest in the themes of changing rural economies, migration and cultural change. His work has received many honors and has been noted for its combination of emotional depth, social conviction, and visual intensity. Matt's work has received grants and awards from the Robert F. Kennedy Memorial Foundation, the National Endowment for the Arts, the Rockefeller Foundation, the California Council for the Humanities, and the Alexia Foundation for World Peace. Matt has also been a finalist for the Pulitzer Prize, and has received a Golden Eye award from the World Press Photo Foundation. Matt is currently raising funds through Kickstarter.com to continue a long-term project called The People of Clouds which is documenting the migration of a whole culture of indigenous Mexicans called the Mixteca (or People of Clouds) to the Central Valley of California in the United States. This fundraising effort ends on August 23rd of 2011 so please visit Matt's Kickstarter page for more details or to pledge. Susana Raab describes herself as "a recovering English major who lives to create visual narratives." Her photographs strike a balance between poignancy and humor (with a bit of irony sometimes thrown in). Raab's work has been exhibited nationally and internationally and has received critical recognition from many sources. Christopher Churchill is a documentary photographer based in Massachusetts whose work has been featured in exhibitions throughout the United States, has been published widely, and is in the permanent collections of several museums. His most recent project "American Faith" examines the topic of faith from within several contexts including religious as well as culture and beliefs. Morea Steinahuer is a photojournalist who's work has taken her across Latin America and Haiti. Morea most recently has been working on collaborative projects connected to end-of-life care and families effected by migration/immigration legislation. A person who seeks out environments of collaboration, mutual mentorship, and engagement around social issues - Morea is someone who is always open to exploring new project ideas and forming new partnerships. In this podcast, Gordon Stettinius returns to Thoughts on Photography to discuss his involvement with Gita Lenz and how that led to publishing a book of her photography and mounting an exhibition as a way of introducing her to a new audience. Gordon also discusses his latest photographic projects as well as his new photographic book publishing company. Kickstarter.com is a social funding platform for individuals working on creative projects. Using Kickstarter, anyone can pledge money towards a project that they feel is worthy however only projects that reach a certain funding goal within a certain time period will actually result in a pledge being paid out. I'm hoping you will be able to pledge (any amount would be wonderful) but I fully understand if you are unable to assist at this time. Even if you are unable to help support this project, I hope you will check back on my web site in the Spring of 2011 to see the results. The deadline for raising funds is December 31st, 2010 at midnight (EST). Please feel free to email me with any questions or comments regarding the project and please feel free to forward the link to anyone else who think might be interested. Thanks in advance for your interest. Leslie Granda-Hill's approach to social documentary photography involves not just making great photographs that tell a story but making great photographs that allow her subjects a way to tell their story from their perspective. Her recent project, Wounded Warriors, exemplifies this personal approach to the photographic essay. Documentary photographer Eliza Gregory focuses on the lifecycle of communites be they in Cuba, Tanzania, or the United States. In addition to working on photographic projects around the world, Eliza also works for PhotoPhilanthropy, an organization committed to supporting documentary photographers in carrying out their work. Gloria Baker Feinstein is a photographer who follows her heart when deciding what to photograph. Her earlier work explored childhood, the relationships between twins, and even the Holocaust. Her latest book, "Kutuuka", focuses on the children of the St. Mary Kevin Orphanage in Uganda and, while a great documentary project in itself, it is the combination of the black and white and color photographs along with drawings made by the children and included in the book which elevate this work to a new level. All proceeds from the sale of the book go towards supporting a non-profit organization called Change the Truth that Gloria started to continue to provide assistance to the orphanage. In this episode, I discuss the topic of persistence in our photographic lives. While one-hundred podcast episodes is an achievement, in a way, the path that I have travelled in getting to this milestone (with the podcast being a reflection of where I was and currently am in my photographic life at any one time) is really what's important here. Persistence is not only important in achieving our goals, it is one of the keys to living a photographic life. Althought I've been (and still am) an advocate of project-based approaches to photography (if only to keep you engaged and making photography regularly), in this podcast I discuss some of the pitfalls to watch out for when using projects as a way to live a photographic life. What do wedding photography and Henri Cartier Bresson's decisive moment have in common? It turns out lots as I discovered after photographing my sister's wedding this past weekend. Jeff Curto wears many hats in his photographic life. He is a professor of photography at College of DuPage and he is the host of two well known podcasts, Camera Position, and History of Photography (which is an exhanced podcast of Jeff's lectures for a course he teaches each term). MOst importantly, Jeff is also an excellent and highly regarded photographer in his own right. In addition to visiting his web site, you can see (and buy) a folio of Jeff's photography which was recently published by Lenswork. I've noticed a recent trend in that calls for entries for juried photographic competitions are continually getting extended past the original due date. Is this a result of the economy and does it mean your chances are better? Share: ToP #0091: Deadline Extended! This past year has been a very busy and hectic one for both my personal life as well as my photographic life. 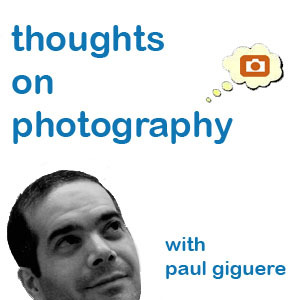 In this podcast, I discuss the progress on my resolutions from last year for Thoughts on Photography and the new directions I plan to take the podcast going into 2010. ToP #0088: What's Stopping You Now? Share: ToP #0088: What's Stopping You Now? willingness or need to share these beliefs so openly while also hiding their personality and nature at the same time. Lauren Semivan creates imagined events through the use of staged photographs. This approach gives her both the control necessary to tell a story while incorporating autobiographical elements into the narrative such as dreams, preoccupations, desires, anxieties, and the collective unconscious. Lisa Kereszi's latest monograph "Fun and Games" explores places where some people might go to escape from the boredom and challenges of everyday life. Boardwalks, dance halls, the great outdoors, and even strip clubs are all places of interest for Kereszi but rather than give us a glamorized travelogue, Kereszi scratches below the surface, sometimes deeply, to show us what these places of interest are really like and, in a way, that makes them even more interesting (and maybe even fun). Currently in the photographic art world, style and process seem to be the means by which we measure photography worthy of the title "art." This is why I found Lori Vrba's photography to be so exciting. Her total devotion to the subject matter to her photographs, rather than to "how" the photographs were made, set Lori apart and provides a welcome and refreshing journey. Elizabeth Fleming's photography captures the small moments of everyday life. Children at play, objects in our everyday world, and the non-events that surround us provide opportunities to slow us down so that we can appreciate the wonderful subtleties that life offers us every day, that is if we will only take a moment to be stopped by it. Tootie Nienow enjoys exploring photography through experimentation both in terms of tools, technique, and subject matter. Her photography is both conceptual and sublime and at the same time her work is also intriguing and engaging, and yes, even beautiful too. Beth Kientzle's photographs, which focus mostly on urban and natural landscapes, are made using alternative tools and techniques. This allows her to play with abstract shapes, light, and motion in her photographs. Although Kientzle's approach introduces an element of chance into her photography, it is chance tempered with a distinct and unique vision. This is the second podcast in a three part series dealing with the issue of projects. Today I talk about working on multiple projects. Below are some links to various resources mentioned in the podcast. Alan George is a San Francisco-based photographer who came to photography not through the halls of higher learning or by becoming enamored with photography as a child or as an artist in another medium who discovers photography as their "trueâ€ medium but rather, as someone who used a camera in much the same way as most people do, to record life's events . . . in other words, he was a snap-shooter. In 2003 photography became a more central part of Alan"s life, a way of exploring the social landscape. The process of searching, selecting and examining something that would otherwise go unnoticed helped him to feel more conscious, more aware, more engaged, more alive. I'm frequently asked by listeners if I can give them a comprehensive critique/review of their photography. Although very brief comments regarding one's work is fine and I do this regularly when asked, a comprehensive review can be time-consuming for me to do. A solution, and a way to support the podcast at the same time, is for me to offer a critique/review service to listeners. A one-hour session is available via phone for $100. All proceeds go towards supporting this podcast. Listen to this podcast episode for more details about what is included. Puerto Rican-born Manuel Rivera-Ortiz uses his camera to explore the world and tell the stories of people who have no voice and must struggle for their existence. His photographic projects in Bolivia, India, Turkey, Cuba, and Kenya highlight the toll extreme poverty can take on the human condition and at the same time, he captures the triumph of the human spirit as people struggle to overcome the extreme conditions that they must deal with daily. This is to date the longest interview I have conducted for Thoughts on Photography and is probably one of the most poignant and thought-provoking both from a photographic and humanitarian viewpoint. It shows how truly powerful the camera that you hold in your hands can be when used to bring attention to the human condition. What is a photographic education and do you need one in order to be a photographer? Is school the way to go to get an education or are there other options? The pros and cons of studying photography at the academy are discussed as well as the role of a photographic education as a part of the photographic life. Julio De Matos is based in Portugal and I first got to know of Julio's work through his book "Fading Hutongs" which are photos of hutongs taken in China and through that work, I came to discover other significant bodies of work. Incidentally, "Fading Hutongs" was one of my favorite books of 2008. Part of Julioâ€™s initial work deals with and explores interconnections using alternative photographic processes. His later work, while on the surface, could be labeled travel photography, goes deeper into social commentary in the documentarian tradition by raising awareness of the survival and extinction of ancestral cultures. Julioâ€™s most recent work is closer to home and explores the influence of Brazilian architecture on the architecture of Portugal as well as the confluence of digital interventions in the landscape and subsequent print. Julioâ€™s photography has been widely exhibited and he has had several books of his work published. I find exploring Julioâ€™s work like peeling an onion with many layers, each one more revealing. Shane Lavalette is a recent graduate with a BFA from Tufts University in partnership with The School of the Museum of Fine Arts, Boston. Shane writes extensively about photography through his photo-related blog where he focuses primarily on fine art photography and issues concerning contemporary photographic practice. He features individual photographers, books, exhibitions and interviews. Shane is also the founder and editor of Lay Flat, a new print publication of contemporary photography and writing that uses an innovative magazine format for the articles and actual prints of the featured photographs. Shane, who's personal photographic work has been well received through various exhibitions and awards, represents a new breed of young photographers who are putting as much an emphasis on the contributions they can make to the field of photography as on their own personal work. Like many photographers, Natalie Young didn't start out with the intention of becoming a photographer but rather, photography found her. She left a career in finance, married a musician and began living the photographic life. After photographing on her husband's family farm, Young eventually realized that she had not only a body of work but had work that could feed her artistically. As with the farm series, Young's approach to photography is usually a reflection of personal life and it is this approach that has given her the success she now enjoys with her photography. Whether it is her lush photographs of botanticals, images of New Orleans, or her southern landscapes, Victoria Ryan brings a certain atmosphere to her photographs that is so strong, one can almost feel the textures of the plants, smell the decay of the swamp, or feel the thrill of Mardi Gras from the viewpoint of an insider. Photo contests can be great ways to get your work on there and in front of other people. Photo contests can also help you develop and refine the skills of editing your work for submission. Recently though, more and more contests are developing rules whereby you lose ownership of your photography upon submission. Although the price of entering most contests is free, the ultimate price (the loss of ownership of your photographs) is too high a price to pay. Ken Rosenthal's images make use of diffusion, blur, and high contrast as a way of exploring his personal experiences through common memories and archetypes that we all share. His images evoke moods that run the gamut from a veiled happiness to a discordant nostalgia with some anxiety thrown in. It is Rosenthal's deep connection to his own psychological thoughts though which is on display and through his lens, we begin to see a bit of ourselves in his images. Suzanne Revy's commercial portraiture (mostly of children) is truly excellent. Revy has that gift of being able to bring out a child's personality and then capture it on film. The result is something that families cherish for ages. It's no surprise then that Revy's personal fine art work (again mostly of children) captures the essence and personality of her subjects. The different in her fine art work though is that Revy also infuses a sense of place and time that evokes a shared sense of history, nostalgia and time. Also mentioned in this podcast is the Griffin Museum. Stella Johnson is a documentary photographer who brings an engaging and captivating approach to her subjects. Her latest book, Al Sol: Photographs of Mexico, Cameroon, and Nicaragua is a great example of documentary photography that also works as fine art photography. ToP #0059: Black & White or Color? Which is better, black and white or color photography? I've gotten asked this question many times by listeners and I find the question to be kind of strange because it all depends on what you are trying to communicate or accomplish with your photography. Sometimes it comes down to how well you create and develop your photos in one process or another (your skill), sometimes it is a matter of personal preference, and sometimes your subject tells you how to proceed. The bottom line is to follow your instinct and preference and not let anyone (including the marketplace) tell you it must be a certain way. Share: ToP #0059: Black & White or Color? Podcasts are a labor of love for those who create them however, even love has a price. This podcast outlines some ways you might help support your local podcast (and in particular Thoughts on Photography) by purchasing items from sponsors, click-throughs to sites such as B&H Photo and Amazon.com or just a direct donation through PayPal. Have no fear, this podcast will always be free to anyone who cares to download and listen to it but any way to offset some of the costs of doing the podcast would be greatly appreciated and if you can't help financially, then an email of appreciate goes a long too. Thanks in adavance. Angela Bacon-Kidwell's photography is the stuff of dreams (literally). Angela uses photography as a way to bring substance to her dreams and sub-conscious thoughts through her photographic imagery. Angela has also found recent success with her photography and her insights and thoughts are helpful and instructive to photographers no matter where they are on the spectrum regarding the promotion of their photography. Miksang is a Tibetan word that translates as â€˜Good Eyeâ€™, and is based on the Shambhala and Dharma Art teachings of the late meditation master, artist, and scholar ChÃ¶gyam Trungpa, Rinpoche. Michael Wood is a Miksang teacher and mentor who has been practicing and refining Miksang over the past thirty years. Our discussion focuses on how Miksang can be a direction to take in working towards living a photographic life through the integtration of contemplative photography. Hiroshi Watanabe's photographic work is both inspiring and engaging. From his "Kabuki Players" series to his most recent (and very different) series "Ideologies in Paradise", Watanabe's photographic sensibilities and his experience help show us a path torward living a photographic life. Note: Due to some technical issues with this episode, you will notice sound drop outs and a recurring blip sound. I apologize in advance and hope you still enjoy the interview. In this podcast I discuss the isolation we sometimes feel when working on our photography and how, in reality, we are really more connected with other photographers than we realize. In a sense, we are all part of a photographic family and should never forget that fact when we find ourselves struggling to live the photographic life. This podcast discusses the book "On Looking at Photographs: A Practical Guide" by David Hurn and Bill Jay. The book is published by Lenswork Publishing and provides some great insights on how to look at , or read, a photograph (which hopefully in turn helps us as photographers make better photographs). Joe Wigfall is a New York-based street photographer who first came to my attention through a WNYC radio station project and contest highlighting the working styles and philosophies of several working street photographers in New York. The short video of Joe is wonderful to watch (as are many of the other videos made for other photographers). Joe went on to win the contest and I found his photos (and his process for making them) to be truly excellent. Joe's approach to street photography is refreshing, engaging, and above all, motivating. In this podcast I discuss the current resurgence in interest in the work of William Eggleston. An retrospective exhibition of Eggleston's work on display at the Whitney Museum of American Art along with a new book/catalog of the exhibition. Coincidentally, a new DVD documentary is also available as well. There has never been a better time to get to know the work Eggleston than now. Ibarionex Perello is a California-based photographer, writer, and educator. Ibarionex is a contributing writer for Shutterbug Magazine, PC Photo, and Digital PhotoPro. He is co-founder of Alas Media, a studio dedicated to telling stories through a variety of media, and is the host of the Candid Frame, a podcast focused on interviews of photographers across the wide spectrum of the photographic world, and FotoBoy, a blog on photography. Getting known as a fine art photographer, that is getting your work out into the photographic public and gaining some name and photographic recognition, is not easy and there isn't a magic solution. This podcast discusses some things you can do though to increase your exposure and help you build a career in fine art photography. In this episode, I explore the philosophy, reasons and rationale behind sharing your photography both as a way of completing what I call the "cycle" of photography and as a way of living the photographic life. I recently picked up a book by Philippe Gross and S.I. Shapiro called "The Tao of Photography: Seeing Beyond Seeing." Ignoring the overused "Tao of Whatever" as a part of the title, I found this book to be excellent and the advice useful at all stages of your photography. I recently attended a photo workshop at the Center for Photography at Woodstock in Woodstock, NY with Constantine Manos. Photo workshops can be fun, invigorating, and yes, expensive and even unsettling but I think they are one more thing we can do lead a photographic life. Lorenzo is a New York City based street photographer who began using digital cameras just a few years ago. His use of the digital cameras as a part of his work flow has liberated him and has allows him to achieve new creative (and prolific heights) with his photography including several self-published books through Blurb.com. Lorenzo's intense passion and interest in photography helps him to lead a photographic life in the truest sense. Although I'm extremely happy to be re-exposed to Frank's work, of particular interest to me is the Zero Mostel book which I found to be a delight. All of these books are not only worth your attention but should be on your bookshelf. More books by Frank are promised in the coming months and year. ToP #0036: Film vs Digital? Although digital cameras have been with us for quite awhile and the quality of images produced with digital cameras can equal or are better than film-based cameras, the issue of film versus digital continues to permeate our photographic discussions. This podcast attempts to re-frame the issue as not one of quality but rather process (or how we like to work). I know this can still be a hot button issue but hopefully my thoughts add, in a constructive way, to the decision-making that some photographers still grapple with when contemplating film or digital in their photographic life. Share: ToP #0036: Film vs Digital? In this podcast, photographer Aline Smithson and I have a conversation regarding her approach to photography, the creative process, and a wide range of topics related to the photographic life. You can see Aline's work and read more about her at her web site. Aline also maintains a blog called Lenscratch where she frequently discusses work by other photographers and news of interest to the fine art photographer. Sometimes our photographic comfort zone (the typical subjects, tools, and places that we are most comfortable with in our photography) can be our biggest barrier to making creative leaps in our work. Finding the courage to occasionally leave your comfort zone behind can lead to the "next step" in your photographic life. This episode references the book "Art and Fear" by David Bayle and Ted Orland and is highly recommended. In this podcast, photographer Gordon Stettinius and I have a conversation where we discuss Gordon's approach to photography, his creative process, and a certain philosophy of photography. You can see Gordon's work and read more about him at his web site. During the course of the discussion, we also make mention of a web site called HolgaMods which is Holga camera modification and enhancement business run by Randy Smith. Since we mentioned it in the podcast, I just thought it would be good to make the link available here. ToP #0032: Cameras as Weapons? This podcast discusses some of the essays of Susan Sontag, which can be found in the collection "On Photography", and in particular the idea that a camera can be viewed as a weapon. A controversial thought to be sure but one that I hope elicits a conversation about how photographers view their tools and the role they play in the creative process. Share: ToP #0032: Cameras as Weapons? In this podcast I discuss the 20X200 photography and fine art print sales site hosted by Jen Bekman of Jen Bekman Gallery in New York City. Their whole approach to limited edition sales of prints involves pricing three different size prints (small, medium, and large) in different quantities (200, 20, and 2 respectively) at varying prices ($20, $200, and $2,000 respectively). This could be a whole new approach to limited editions and pricing in general for most photographers that allows the average person the ability to purchase a photograph based on their budget and their motivation as a collector of photography. In this podcast I discuss juried photo exhibitions, what they are, how they work, and the pros and cons of entering them. I also provide some helpful tips should this be something you wish to pursue for your own fine art photography. An excellent resource for finding out when and where various exhibition opportunities are and other great advice for marketing your fine art photography is Mary Virginia Swanson's book "Marketing Guidebook for Photographers." Ms. Swanson also maintains a blog that frequently list exhibition opportunities as well. In this podcast I interview photographer Bill Vaccaro to discuss his photography, his creative process, and how he goes about living a photographic life. You can see Bill's work and read more about him at his web site. In this podcast, I discuss how learning from other photographers and their work (sometimes through imitation) can be essential step towards learning how to see photography and contributes towards gaining inspiration for your own work and eventually your own vision. In this podcast, I try to address the question of what it means to "live a photographic life", a term I frequently use in my podcasts. In this podcast I discuss the importance of model releases and I cover some important issues to remember when shooting in public. Below is a sample model release that you can copy and modify to suite your particular purpose. Also, here is a link to a document called "The Photographer's Right: Your Rights and Remedies when Stopped or Confronted for Photography" by Bert Krages, Attorney at Law. I, _______________________________, grant [PHOTOGARHER NAME] all rights and permission to use the photographs taken of me on ____/____/____ at __________________________, _______ in any manner [PHOTOGARHER NAME] chooses. I, undersigned, being the parent of guardian of the minor whose name appears above, hereby consents to the forgoing condition and warrants that I have the authority to give such consent. In this podcast I discuss the photographer's obsession with cameras, gadgets, and technology and I offer up some tips on breaking the chain of the "must upgrade" craze. In this podcast, I discuss the various debates that have occurred in photography since its early beginnings through present day and how these debates, while sometimes useful to move the entire field of photography forward to the next evolutionary level, can also stifle our creativity as photographers. This podcast explores the concept of "flow." According to the definition on Wikipedia, flow is a mental state of operation in which the person is fully immersed in what he or she is doing, characterized by a feeling of energized focus, full involvement, and success in the process of the activity. In photography, flow can be used to help achieve a sense of heightened creativity with your photography. Low Skill - High Challenge = Typically causes frustration and anxiety. High Skill - Low Challenge = Can bring about contentment and can build confidence but the challenge must increase to encourage true engagement. ToP #0014: Does Print Size Really Matter? Share: ToP #0014: Does Print Size Really Matter? In this podcast, I discuss ideas that help you remain engaged in your fine art photography when time doesn't permit to actually go out and make photographs. In this podcast, I discuss the role of motivation in promoting your fine art photography. In particular, I cover three specific levels of motivation and use them to create a framework to help you effectively promote your work while remaining true to your goals as a photographer. This podcast focuses on photo reviews (or portfolio reviews) and provides an overview of how they can help emerging photographers move to the next level with their fine art photography. Exploring what it means to live a photographic life.